6 pm view from Area 31 terrace, located at Area 31. 270 Biscayne Boulevard Way, Miami, FL 33131. Photo, Aurea Veras. The name derives from Fishing Area 31, an international zone designated by the United Nations Food and Agriculture Organization as a sustainable fishery, which explains the accent on local ingredients. “Given the proximity to the ocean, we take a little extra pride in our seafood, sourcing ingredients from our favorite local vendors,” Chef Alex Olivier observes. The official brochure reinforces the concept: Blending worldly influence with local inspiration, Area 31 creates a cuisine that’s elegantly approachable. It’s open for lunch, dinner, Sunday brunch and happy hour, indoors or out on the terrace — currently under renovation. Ceviche Mixto, Area 31. Photo, Johnny Flores. A little cyber-spying shows people did enjoy the place as I did. One gentleman judged his prime ribeye perfectly done. 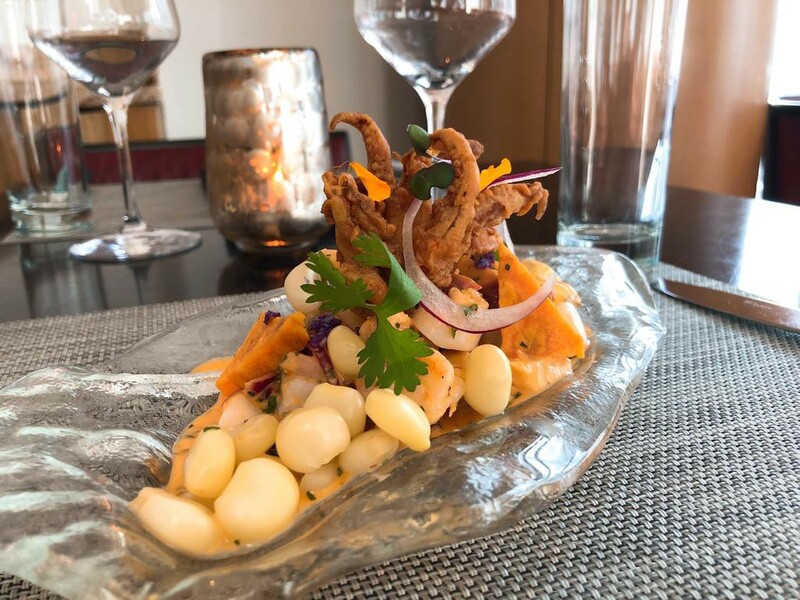 Another recommends it highly, having had for starters the ceviche mixto — octopus, catch of the day, rock shrimp, tentacles, red onions, corn nuts, sweet potato, and Rocoto pepper. A lady visiting from New York raved about the Islamorada swordfish, served with tomato-citrus compote. I do have a sweet tooth, or to put it more succinctly, without desert culinary art is a misnomer. I ordered a Molten chocolate cake. The view is both breathtaking and conducive to meditations about great historical ironies. 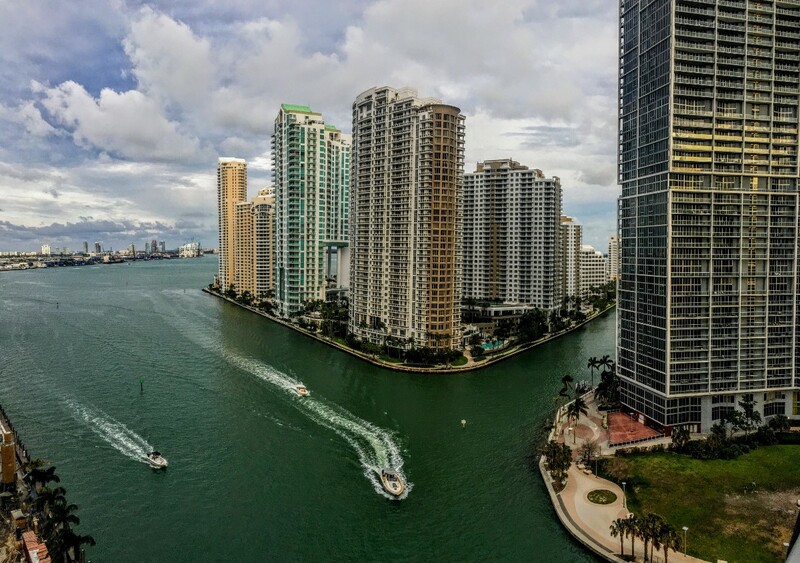 You can see from any window the spot where the Miami River and Biscayne Bay converge. Ponce de León discovered the Tequesta back in 1523 from that precise point. The Spanish explorer ventured to present-day Miami in search of gold, but not finding the precious metal, he concocted the theory of Eternal Youth. Sadly, a poisoned arrow to his neck ended the adventure. It so happens that a contemporary of Ponce de Leon, a teenaged survivor of a Spanish shipwreck, lived for years under a Tequesta Chief named Carlos — yes, even captive Spaniards gave people and things whatever names they wished. He lived to tell the tale, and from his autobiography, we know the natives’ diet was rich in seafood, especially lobster. To end the evening we had the last drink contemplating the moon’s reflection on the Bay, contemplating the fountain of youth, such a great metaphor for the possibility of reinvention that Miami has always afforded out-of-towners. If you liked this article, please share it. For more news and current analysis, visit Downtown NEWS in Facebook.